I read some of this a year or so back while it was still a work-in-progress – and it IS full of laughs! 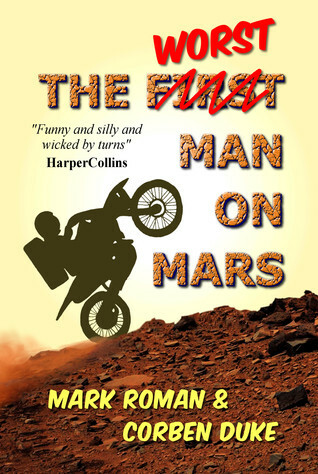 ‘The Last Man On Mars,’ is published by Grand Mal Press and will be available from 2nd September 2016. Flint Dugdale, blunt Yorkshireman and reality TV show winner, seems an unlikely contender for First Man on Mars. The Right Stuff he is not. But the tragic death of the mission’s brave commander has created a vacancy which Dugdale, with his large frame and ‘persuasive personality’, has been quick to fill. He has put himself in charge of Britain’s first group of colonists to the Red Planet. With a place in History assured, Dugdale plans to see out the rest of the mission drinking lager, eating pies and watching his favourite sports on wide-screen TV. But all is not well on the Martian surface. For five years an advance party of robots with evolving AI personalities have been building Botany Base. They are a long way behind schedule and have made some crucial dimensioning errors. So the base’s rooms are too small, the doors don’t fit, and the lift-shaft is too narrow for the space elevator that is to bring the humans down from their spaceship. Worse, the food supplies sent from Earth have mysteriously gone missing, the drinking-water is muddy, and the Polish builder bots have gone AWOL. On the eve of the descent to the surface, Dugdale knows nothing of these problems. And he is also unaware that the ship’s scanners have detected living organisms two miles north of the base. It seems there is Life down there. But will it be pleased to see him? Posted by Cee Tee Jackson on August 21, 2016 in Uncategorized.